Forty years ago, a cruise ship from the mainland sailed into Honolulu Harbor at sunrise. On deck, Roger Peckenpaugh, now the Kukui’ula Landscape & Farm manager, got his first look at the Hawaiian Islands. He was fresh out of college. Had come for the surf. But watching the sunrise, Roger knew he wanted to make Hawaii his home. With experience growing papayas on Oahu and a degree in tropical agriculture under his belt, he eventually made his way to Kaua’i, long known as the Garden Island for its rich soil, lush greenery and ideal growing conditions. “It was a unique location. I wanted to farm on this island,” Roger says. Before helping to cultivate Kukui’ula and its farm and gardens, Roger spent 20 years in agriculture on Kaua’i. Ask him to name some of his favorite tropical plants and he can rattle off a long list of island species, both by their Latin and common names. It’s like speaking a second language, especially the florals. Roger was instrumental in establishing the flower industry on Kaua’i. 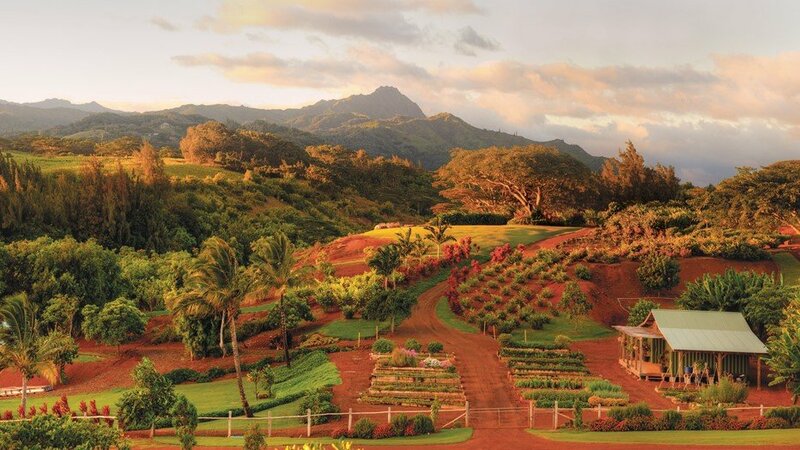 Now, he heads a team that’s responsible for Kukui’ula’s vast acreage, the centerpiece of which is The Farm, which connects Kukui’ula to its own agricultural heritage. When Kukui’ula was sugar plantation property, The Farm’s reservoir provided the land’s irrigation. But Roger describes The Farm not just as a place for relaxation, recreation and picking up fresh fruits and veggies. He thinks of it as a kind of time capsule. “We never did any land grading up here,” he says. That’s why the area around The Farm retains its steep contours, rugged hillsides and winding waterways. It’s popular for fishing, boating, hiking, and mountain biking, or just lounging under the monkey pod tree. And if you’re open to it, you can also experience something deeper. Something ancient. “If you come here, you don’t just take,” he continues, talking now about the life and lifestyle of Kaua’i, which has nourished him body and soul for four decades.